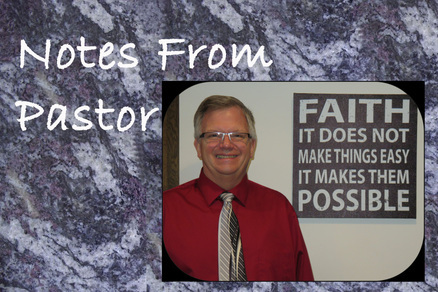 On this page, you can read selected Grace Notes articles from Pastor Tim Renstrom from past months and study them in closer detail. Enjoy! The Lutheran Church–Missouri Synod (LCMS) is strong on doctrinal topics but weak on the books of the Bible. After teaching at Concordia Seminary, St. Louis for 35 years I’ve come to that conclusion. In the Synod those trained theologically can typically articulate our orthodox doctrinal position and can work with Lutheran concepts. They can explain, for example, the differences between deus revelatus and deus absconditus. But they can’t tell you the first thing about Haggai or Chronicles or 1 John. The situation is not a case of false doctrine. It’s just weird. The theological debates that take place in Synod typically deal with Luther and Luther’s theological position. We debate Luther… After a while I want to respond: “What does the Bible teach? You know, the Bible, that book collecting dust on the bookshelf.” By listening to our debates one would get the impression that we are a Society for Luther Studies. Occasionally I visit other churches to hear a variety of pastors preach. Sometimes I am thrilled to hear a solid, textual sermon. But I am surprised how often I hear topical sermons without a specific text in a specific book of the Bible. The sermons are doctrinally sound. I am not hearing LCMS preachers preach false doctrine. But often there is no functioning biblical text from a biblical book in the pulpit. It seems to me that in the Missouri Synod the 66 books of the Bible take a backseat. Yet, we need to remind ourselves of the obvious. First and foremost, the Bible is a collection of books, not a collection of favorite verses or doctrinal topics but a library of books. And each book needs to be treated as a book, read in a holistic way by attending to how it flows from the opening verse to the closing verse. That is simply respecting the shape of the inspired Scriptures themselves. The Sacred Scriptures come to us in the form of books. If Martin Luther were here today, my hunch is that he would agree. After all, he wanted the people to read, mark, learn, and inwardly digest the Scriptures themselves and not only learn summary statements of what the entire Bible teaches. That is why he translated the Scriptures into the language of the people. That is why he preached and lectured through books of the Bible. Our motto of sola scriptura sets up the expectation that our churches and ministers actually theologize that way, that in these churches the pastor is all about the Ministry of the Word, not “social justice” or “inclusivity” or feel-good psychology, but the Ministry of the Word (Acts 6). That requires devotion to both the orthodox [doctrine] and the books of the Bible. Then, finally, God got through my slow, cob-webby thought processes. Snow. But not just snow. “Though your sins are scarlet they will as white as snow…” All this snow I’ve been playing on, all this snow that we have been fussing about as we have to move it out of our driveways and parking lots, all this snow that we have been have to worry about as we drive…all this snow is a reminder to us of God’s greatest gift to us! The forgiveness and removal of all our sins! Our free ticket to abundant and eternal life! As it says in Isaiah 1:15b-17: “Your hands are covered with blood. Wash yourselves. Cleanse yourselves. Remove your evil deeds from my sight. Stop doing evil. Learn to do what is good. Pursue justice. Correct the oppressor. Defend the rights of the fatherless. Plead the widow’s cause.” (CSB) But our every inclination is evil, from the time we are born (Genesis 8:21). We cannot wash ourselves. But the Lord said, “Come, let us settle this.” And the triune God sent the Son, the only Son, to do what we cannot do. He fulfills the instructions of Isaiah—the instructions of the whole Word of God, because he is the Word of God. And He offers himself as our substitute, our sacrifice, and satisfies the perfection of our perfect creation by our perfect God. Now our sins are as white as snow…no longer red…no longer seen…gone as far as the east is from the west. We are forgiven, given grace and given faith to trust that grace so that we may be brought home to home in heaven. Thanks be to God we can live life in that sure and certain knowledge! Perhaps…just perhaps…you will try to join me in a change of heart? Instead of ‘cursing’ the snow of this ‘record-breaking’ February 2019, we can see it as a symbol that God uses to remind of his great love for us in Christ Jesus! Doxology? What does this mean? Over the past few months the word has been tossed about around our congregations as a title to some workshop or conference that pastor was, and then pastor and some lay leaders were going to. But what does this mean? Doxology. My Merriam Webster 9th New Collegiate Dictionary has, perhaps, the simplest definition: “a usually liturgical expression of praise to God.” The Lutheran Service Book defines doxology in its glossary as, “Words of praise addressed to the triune God. Hymns that conclude with a doxological stanza are so indicated with a r.” The Lutheran Cyclopedia explains it as, “[A s]tately and exultant hymn of praise addressed to the Triune God or to a single person of the Godhead…” It, and my A Dictionary of Liturgical Terms, identify two liturgical pieces common to many of us as Lutherans, the Gloria Patri and the Gloria in Excelsis, and the ending of the Lord’s Prayer, as examples of doxology. But how does that help us to understand the conference to which pastor and our lay leaders went? Did they just sit around and sing hymns and pray the Lord’s Prayer? If you ask the lay leaders that went, I’m guessing that they’d say that it sometimes felt like that! After all, we had how many worship services in 48 hours? Doxology: The Lutheran Center for Spiritual Care and Counsel. That’s the official name of the RSO (Recognized Service Organization) headed up by Dr. Senkbeil, Dr. Yahnke, and Dr. Flemming designed to offer training, support and encouragement to pastors and congregations as we respond to God’s service to be in service to him. God’s service? God sent his only begotten son to live, suffer, die on a cross, rise from the grave, ascend into heaven and rule over all creation to pay for the sins of the whole world and forgive the sins give eternal life to those who do not reject his outreached hand and believe in Jesus. Our service? In response to his Holy Spirit, we believe in Jesus and work in his kingdom to be his hands and feet, ears and mouth, to proclaim his forgiveness and life that others will come to the same faith through the same work of the Holy Spirit. So where’s the doxology? The hymn of praise? When pastor and congregation work together in God pleasing ways, it is a hymn of praise to our Triune God! When they do not, it is a song of great sorrow. Bringing pastors and lay leaders together to learn from God to help them be a positive witness of God’s grace assists in ‘writing’ that doxology. That’s what these conferences are about. A group of five of us went to Racine, WI, last weekend. (Imagine riding 6+ hours each way in a pickup with pastor!) It was a weekend filled with hard work and lots of conversations. I encourage each of you to talk to Brian Moreau, Carol Werlein, Kay Christensen and Steve Baker. Buy them a cup of coffee (they all drink it—some even drink the ‘froo-froo’ stuff!). Get your money’s worth in learning what they learned. I don’t know the specifics of what the lay leaders heard and said…only what they have chosen to share with me to this point. But, then, they don’t know all that the pastors discussed, either—not because it is secret, but because there is only so much that the human brain can absorb at any given time! But, if by God’s grace, what comes out of our time together brings glory to God through our ministry together in our congregations and builds faith in the faithful and brings faith to the faithless…that is an awesome Doxology! The man I’m going to tell you about was not a scrooge, he was a kind decent, mostly good man. Generous to his family and upright in his dealings with other men. But he just didn’t believe in all of that incarnation stuff that the churches proclaim at Christmas time. It just didn’t make sense and he was too honest to pretend otherwise. He just couldn’t swallow the Jesus story, about God coming to Earth as a man. He told his wife, “I’m truly sorry to distress you, but I’m not going with you to church this Christmas Eve.” He said he would feel like a hypocrite and that he would much rather just stay at home, but that he would wait up for them. So he stayed and they went to the midnight service. Shortly after the family drove away in the car, snow began to fall. He went to the window to watch the flurries getting heavier and heavier and then he went back to his fireside chair and began to read his newspaper. Minutes later he was startled by a thudding sound. Then another … and then another. At first he thought someone must be throwing snowballs against the living room window. But when he went to the front door to investigate he found a flock of birds huddled outside miserably in the snow. They’d been caught in the storm and in a desperate search for shelter they had tried to fly through his large landscape window. That is what had been making the sound. Well, he couldn’t let the poor creatures just lie there and freeze, so he remembered the barn where his children stabled their pony. That would provide a warm shelter. All he would have to do is to direct the birds into the shelter. Quickly, he put on a coat and galoshes and he tramped through the deepening snow to the barn. He opened the doors wide and turned on a light so the birds would know the way in. But the birds did not come in. So, he figured that food would entice them. He hurried back to the house and fetched some bread crumbs. He sprinkled them on the snow, making a trail of bread crumbs to the yellow-lighted wide open doorway of the stable. But to his dismay, the birds ignored the bread crumbs. The birds continued to flap around helplessly in the snow. He tried catching them but could not. He tried shooing them into the barn by walking around and waving his arms. Instead, they scattered in every direction … every direction except into the warm lighted barn. And that’s when he realized they were afraid of him. “To them,” he reasoned, “I am a strange and terrifying creature. If only I could think of some way to let them know that they can trust me. That I am not trying to hurt them, but to help them.” But how? Any move he made tended to frighten them and confuse them. They just would not follow. They would not be led or shooed because they feared him. At that moment the church bells began to ring. The sound reached his ears above the sounds of the wind. And he stood there listening to the bells, Adeste Fidelis, listening to the bells pealing the glad tidings of Christmas. Sound at all familiar to your life? Perhaps you’re the secretary waiting for someone else to do their job? Perhaps you’re having to wait for weather or other factors beyond your control to do important things? Or maybe it’s health problems, aging problems, family problems, financial problems…? This time of the year (Thanksgiving, Christmas) seems to magnify everything that’s moving with difficulty. The following is from 49 Worship Stories for Children, by Theodore W. Schroeder, CPH © 1957, St. Louis, page 111ff. It is based on Mark 4:35-41. That day when evening came, he [Jesus] said to his disciples, "Let us go over to the other side." Leaving the crowd behind, they took him along, just as he was, in the boat. There were also other boats with him. A furious squall came up, and the waves broke over the boat, so that it was nearly swamped. Jesus was in the stern, sleeping on a cushion. The disciples woke him and said to him, "Teacher, don't you care if we drown?" A young man was once flying a training plane over the Gulf of Mexico. It was beautiful flying there among the clouds over the quiet, blue water. But suddenly the engine began to miss. It stopped 5,000 feet above the gulf. The shore was too far away for the man to try to glide his plane in. He was forced to bail out. He jumped, pulled the parachute ring, and slowly floated down to the water. But it was not nearly so smooth as it looked higher up. The gulf was rolling and swelling with waves. The man hit the water. He quickly got rid of his parachute before it pulled him under. He managed, too, to get out of his heavy flying suit and boots. Then he started to swim to shore, which was a long, long way off. He was never a good swimmer, and it was terrible fighting those waves. He seemed to get nowhere. He became exhausted and panicky as he shouted for help. After half an hour he felt he had to give up. He would sink quickly and get it over with. “This is it. This is my end,” he thought desperately. He pictured in his mind his young wife and baby, and sobbed. He stopped thrashing in the water and let his legs drop in what he thought would be his last moment. But suddenly his feet touched the bottom. He found he could stand up with his chin out of the water. He was on a log sand bar that stretched out far from the shoreline, as many do in the Gulf of Mexico. All the time that he had been struggling the ground was only a little way below him, and he could have been standing up. He needed only to wade into shore. God loves us. Jesus loved us so much that He died for us on the cross. He will take care of us. Why do we worry and why are we afraid? I know that you children worry, too, not only we grownups. You are often afraid of the dark, afraid in a storm, afraid of an accident, afraid of getting hurt. Some of you worry about Mother or Dad or yourselves getting sick. You worry about your school work. You worry about getting left out. Many things. Wise words to children—of all ages! I find, in that list of things children might fear at the end of Pastor Schroeder’s story, things that every adult also struggles with…darkness, storms, accidents, getting hurt, loved ones getting sick, our work—and even the FoMO (Fear of Missing Out—it’s so common there’s modern ‘slang’ for it!). Still, the one who died and rose for us to bring us close to him is the one who calms the storms of our lives. “Be still,” Jesus says. And it is still. I do not understand what I do. For what I want to do I do not do, but what I hate I do. And if I do what I do not want to do, I agree that the law is good. As it is, it is no longer I myself who do it, but it is sin living in me. For I know that good itself does not dwell in me, that is, in my sinful nature. For I have the desire to do what is good, but I cannot carry it out. For I do not do the good I want to do, but the evil I do not want to do-- this I keep on doing. Now if I do what I do not want to do, it is no longer I who do it, but it is sin living in me that does it. So I find this law at work: Although I want to do good, evil is right there with me. For in my inner being I delight in God's law; but I see another law at work in me, waging war against the law of my mind and making me a prisoner of the law of sin at work within me. What a wretched man I am! Who will rescue me from this body that is subject to death? We have higher incomes, but lower morals; We've become long on quantity, but short on quality. These are the times of tall men, and short character; Steep profits, and shallow relationships. More leisure, but less fun; More food, but less nutrition. In the 1500’s, Martin Luther struggled with the same questions. He became convinced that the Bible holds two truths about us simultaneously: We are saint and sinner at the same time. Saint, because we are saved by Jesus. Sinner, because, even though we have been saved, our sinful nature still leads us to sin. So what’s the answer? Verse 25 of our reading above gives it to us: “Thanks be to God, who delivers me through Jesus Christ our Lord! So then, I myself in my mind am a slave to God's law, but in my sinful nature a slave to the law of sin.” We are turned to our deliverer and accept his deliverance from this paradoxical life. He is our only hope. And he has come down to rescue us. The following article is from an LCMS Publication called ‘Reaching Rural America for Christ’ and was written by Pastor Todd Kollbaum. Angie and I recently had the privilege of presenting at this year’s National Youth Workers Conference in Minneapolis. From that presentation, I pulled out three helpful words that might provide some guidance in many aspects of our various ministries. The first word is “intentionality”: Too often we simply float along and hope things work out for the best. However, this is pretty much a recipe for failure, or at least disappointment. Instead, let us prayerfully consider the path that God has laid out for us and then be intentional about moving along that path in our ministries. When there are road bumps and hiccups along the way, having a mindset of intentionality allows us to weather those without derailing the whole process. Now, intentionality doesn’t mean bullheadedness but simply that we are being deliberate and purposeful in what we are planning and doing. The second word is “consistency”: In ministry, we often look for the warm body who won’t say “no” when asked to serve in one capacity or another. While this might seem to fulfill our obligations, it is not a good way to do ministry. In order for anything to have a lasting impact, it is important for there to be consistency, both of program and people. That doesn’t mean we shouldn’t change or even that a person should cease doing a particular job. What it does mean is that we don’t serve until it isn’t convenient or until “our turn” has been completed, we serve until the Lord calls us to serve in a different way. (Notice we continue to serve.) In this way, we provide consistency for those among whom we serve as well as consistency in what we are doing. Consistency also involves “consistent” evaluation of what, why and how we are doing things. It is with this type of consistency that we can best serve the Lord and His church. The final word is “relationships”: In rural and small-town settings, it sometimes seems a bit crazy to worry about creating relationships since often our congregations and communities are made up of family and folks we have known our whole lives. However, the relationships I’m talking about here go beyond those kind of surface level relationships we often find. What we’re talking about here is loving our neighbor enough to develop relationships that allow us to share in their lives. To celebrate with them in their joys and help them in their times of trouble. Especially, we are talking about relationships which foster honest conversations about our faith, their faith and how God’s grace is the most important thing we have! May God bless you in all of your ministry endeavors! They’re sending me aw-a-y! Actually, you’re sending me aw-a-y! Which, of course, begs the question, to where, what, when and why? A comprehensive experience of advanced pastoral training offers new skills for pastors to provide transformational spiritual care. Ten days of intensive instruction and peer learning spread over three conference retreats. Up to five hours of individual consultation and mentoring to enrich pastors’ personal and professional growth. How will it benefit our congregation? Skilled pastors are effective pastors. Congregations benefit as pastors are better equipped to provide care for struggling people. Congregations experience greater unity and an increased desire to care for one another. Lay leaders and pastors review together how Christ grows His Church on earth. How does it assist our church leaders? Dedicated laity are vital for a vibrant parish. Your lay leaders are invited to join your pastor for a weekend of instruction, conversation, and problem-solving. DOXOLOGY deepens partnerships between leaders and pastor in service to our Lord and His church. So there you have it. You have the ‘where, what, when and how’ of your sending me aw-a-y! I thank you for this opportunity, and I look forward to what God will work through it as we walk together in his service.